Fresh Peach Cobbler just may be the ultimate summer dessert comfort food. 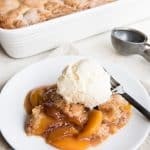 It's simple, easy and a timeless classic with a buttery cobbler topping, fresh juicy peaches, and hints of cinnamon in a rich, sweet syrup. This is the best peach cobbler I have ever eaten! It has a perfectly wonderful crust that is crisp on top but is also soft and moist and chewy thanks to the juicy peaches bubbling below it. Heat oven to 400 degrees. Peel, pit and slice peaches into thick slices. Melt butter and pour into a large 9x13" pan. In a large bowl, combine the sliced peaches, sugars, cinnamon, cornstarch and lemon juice and toss to coat. Pour into the pan right over the melted butter. Bake for 10 minutes in the preheated oven while preparing cobbler topping. While the peach filling is baking, prepare the cobbler topping by combining the flour, sugars, baking powder and salt in a large bowl. Use a pastry cutter or your fingers to cut the cold butter into the flour mixture until it resembles coarse crumbs, then stir in the boiling hot water just until everything is combined. After peaches have cooked for 10 minutes, remove from the oven and drop spoonfuls of the cobbler topping over the peaches. The topping will rise and spread as it cooks, so no need to worry about spreading it around. Just try to cover the peaches evenly with dollops of cobbler topping. Sprinkle the cobbler with the 3 additional tablespoons of granulated sugar, then return to the oven and bake for 30 minutes, until the topping is golden brown and the peach filling is bubbling up around the edges. You may want to bake it on a baking sheet just in case the fruit juices bubble over during the cooking process. Remove from heat and allow to cool for at least 30 minutes to 1 hour before serving with vanilla ice cream. The number of peaches in your filling can vary depending on size. You can always go on the high side even with large peaches if you prefer more fruit to topping, but I wouldn't adjust the sugar content of the fruit filling, even if using a few extra peaches. Also, this is called Fresh Peach Cobbler for a reason, but if you MUST make it during the off-season, I would recommend 10 cups of thawed and drained frozen peaches rather than canned peaches in syrup. But really, nothing beats fresh peaches. Adapted from All Recipes.